Grew my blackcurrant bushes because my father grew them and secondly because I had a childhood addiction to Ribena cordial and lemonade. 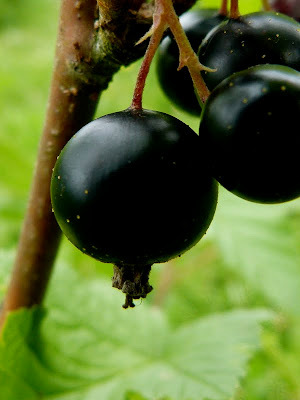 Back in the old days, blackcurrants were treated almost like a medecine. They cured everything from sore throuts to tummy ache and more besides. I know a doctor in Paris, who, when he heard I was off to the countryside to grow vegetables and fruit was insistant that I grew blackcurrant bushes as for him it has the highest Vitamin C count of any fruit and is filled with antioxidants and in our isolation could cure us of all our ailments. In Ireland the blackcurrants took months to ripen but it was still a fruit that flourished in our colder climate and lasted throughout the summer months. You see they love dampness and Ireland has a quantity of just that. The blackcurrant bush enjoys a good frost to kick start it in the early spring. My bushes certainly had none of that but they still seem to be flourishing. After the weekend rain, I have bunches of plump and almost sweet fruit tumbling from branches and its time to do something with them. Most people seem to think that a blackcurrant has to be cooked to be of interest. 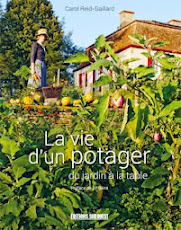 I tend to disagree as I spend my afternoons in the vegetable garden feeding on handfuls of raw berries. After that there's compote and crumble, jam and tarts, jelly and summer pudding or, my favourite, just whisked in a food mixture with your own sugar requirement and served with fresh cream. Easy to freeze them too and I usually have too many all at once as my season here is short but bounteous and use them in the coldest winter months cooked with a roast loin of venison or wood pigeon or in a crumble with autumn blackberries. In a food mixer, crush the berries and then put the wine, leaves and fruit into a large bowl. Mix well, cover and leave to macerate in a cool place for a couple of days. Pass the juice through sieve or a tea cloth into a large saucepan. (You can always use a pair of nylon tights which works just as well as long as they are clean). Add the same weight of the juice in sugar and bring to the boil for 3 minutes stirring all the time to dissolve the sugar. Leave to cool and bottle and seal. Keep for at least 3 months before using. Pour few drops of cassis in a glass and top up with white wine - and drink! When can I come round for a drink?